When I received a Dior Addict Fluid Stick of choice in my Dior x Glamour beauty workshop goodiebag, I couldn't believe my luck as it had been on my wish list for a very long time. I just love glossy lips and the fact that it has the punch of color like a lipstick really appealed to me. I especially fell for the warm pink color, 575 - Wonderland. I got to try it on my lips for the Dior S/S 2014 makeup look that we were thought during the workshop and I also really liked the Dior nail polish with the same name. Because it was going to be sent to my home later on, I was counting the days until I could hold it in my hands again. It arrived to me in the beautiful Dior gift bag with a ribbon and it felt like unwrapping a present. If I hadn't received it as a gift, I would have bought the Dior Addict Fluid Stick just for the packaging alone. It almost looks like a lipstick is frozen inside a cube of ice. The embossed Dior makes it look extra luxurious. The applicator is in the shape of a wide water drop and you can apply the lip product flawlessly on the lips with it. I was also able to pick up enough lip product, so that I didn't need to dip inside the container again. The Dior Addict Fluid Stick has a relatively thick consistency and it does not apply so smooth, but it feels very comfortable on the lips. It is pretty much weightless, as you only feel it stick a bit when your lips touch each other. Right at the start, you also feel a cooling sensation on your lips, which can feel great in the hot, humid summer. Without making much effort, my lips look neat, plump, and pouty. 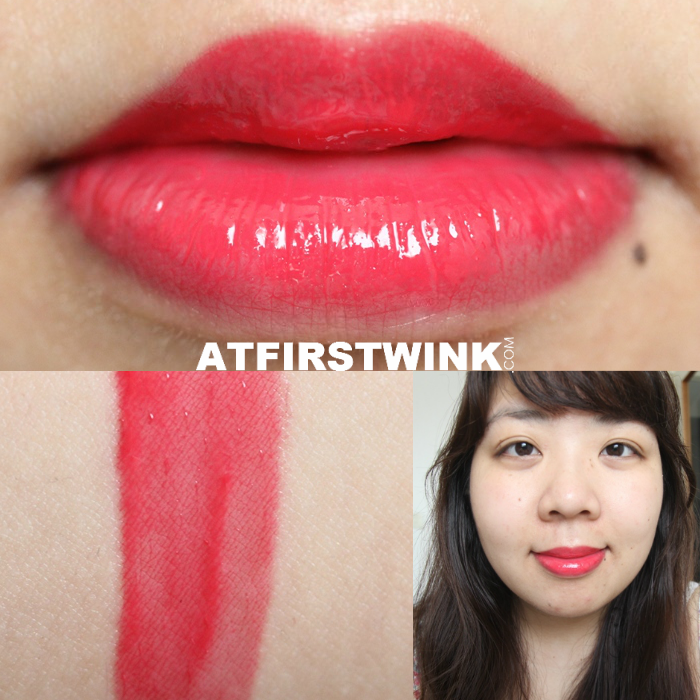 The Dior Addict Fluid Stick 575 - Wonderland has a really pretty red color with a pink undertone. In the beginning, the color can be a bit too much in your face, but it wears off very nicely. You will slowly start seeing the pink more and it stays looking glossy for over a couple of hours. You can also speed up the process by pressing your lips on paper tissue to make the color less bold. This will not make the color on your lips look patchy and uneven, as underneath the glossy coat, it looks like you have lip tint on. The lip color does not stain immediately as it needs some time - so no worries about any mistakes or when it transfers. Some lip lacquers do not attach themselves on the inner parts of the underlip, but this wasn't the case with the Dior Addict Fluid Stick. Together with not needing to touch-up every now and then, it is a total winner to me.